Fred Phelps, the controversial, bile-filled preacher famous for popularizing the phrase, “God Hates Fags”, has died today, March 20th. There will be much talk of how we must meet hate with love, and how instead of protesting his funeral with angry signs (as his group often did at the funerals of soldiers), people should show up with offerings of love and support for his family. It’s certainly a nice idea, and if people do it, it’ll make for a pleasant photo-op to splatter all over the Huffington Post and Upworthy. But let’s be real: Death doesn’t suddenly make horrible actions immaterial. No one mourns for Hitler, no one mourns for Pol Pot, no one should mourn for Bin Laden, and I will not mourn for Phelps, even on behalf of the small percentage of his family that escaped his nightmarish church and brainwashing. A bad person is dead, and that is a good thing. He didn’t die a martyr, he died the way all wretched, atavistic beliefs die: Slowly but inevitably. Phelps’ death, unlike his life, is worth a smile. It’s a nice sentiment to say, ‘All we need is love.’ But love and hate are not enemies. How can we appreciate the full force of love without recognizing the might of hate? If there are things in this world worth loving, surely there are things in this world worth hating, such as oppression and the systematic destruction of people. 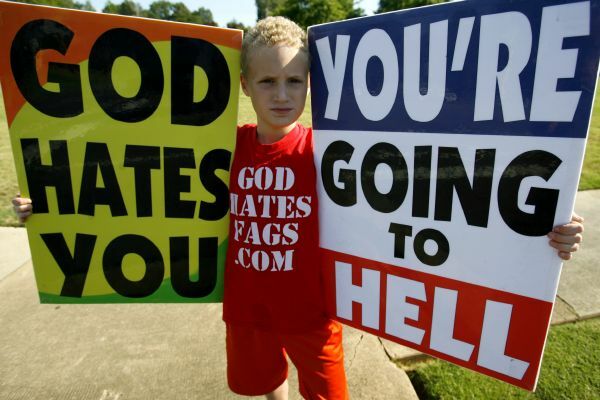 Fred Phelps was not Hitler. Only Hitler was Hitler. But Phelps was a terrible human being, a man led as much by self-aggrandizement as his black heart of hate. And for that, I have no love. May everything he stood for come to a similar end.